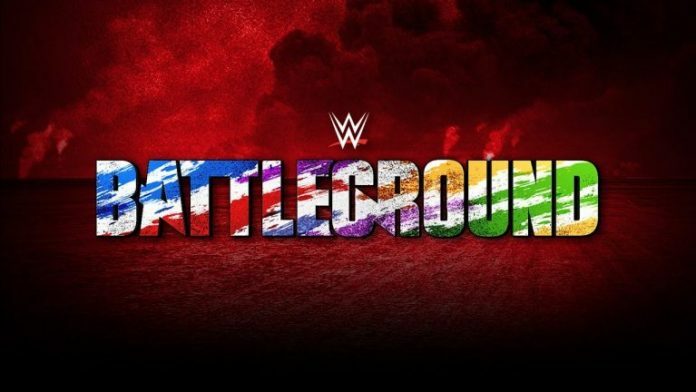 – The WWE Battleground Kickoff pre-show opens with Renee Young, David Otunga, Sam Roberts and WWE Hall of Famer Jerry Lawler. We see the Punjabi Prison structure hanging above the fans as fans find their seats inside the Wells Fargo Center. – We go backstage to Kayla Braxton in the Social Media Lounge. She will be joined by Mike & Maria Kanellis later tonight. Fans can use the #AskMariaAndMike hashtag to submit their questions. We go back to the panel to hype tonight’s matches. Renee leads us to a video package for tonight’s Flag Match. We go backstage to Dasha Fuentes and John Cena. Cena says the Flag Match is like no other match we’ve had in WWE. He goes on and says we’ll see some amazing thing tonight but we will remember either the American Flag standing tall or Cena laying flag on his back. Cena says he can’t stand in the WWE ring and say he’s the best without succeeding tonight. He says damn right, he is ready. We go back to the panel. Lawler and Sam predict Cena to win. Otunga says he wants to see Cena win but he believes Rusev will get it. The panel plugs tonight’s matches, the WWE Network and SummerSlam weekend. Renee sends us to a break. – Back from the break and Renee leads us to a video package for tonight’s Fatal 5 Way Elimination Match to crown a new #1 contender. We come back and Ms. Money In the Bank Carmella has joined the panel. She talks about how she’s already beaten everyone in the match tonight. She goes with Natalya as the winner but says she better watch her back if she does win. Sam picks Charlotte to win while Lawler goes with Natalya as well. Renee sends us to another break. We come back to video of WWE United States Champion AJ Styles at a Philadelphia Phillies game earlier today. We also see footage of AJ’s recent title win at Madison Square Garden. Dasha is backstage with AJ now and he’s confident going into tonight’s first title defense. We cut to Kevin Owens backstage watching the interview. Tom Phillips approaches and Owens cuts a promo on taking his title back tonight. We go back to the panel to discuss the match. Lawler believes Owens will win and Sam goes with AJ. We see Mike & Maria getting ready backstage as Renee plugs the WWE Network and sends us to another break. – Back from the break and Renee sends us to Kayla in the Social Media Lounge with Mike & Maria Kanellis. The happy couple is really into each other, not paying much attention to Kayla. Maria is asked when she will be back in the ring and she dodges the question, talking about how she’s always in the ring with her man, showing the power of love. Mike is asked about his strategy for tonight and he says his strategy is to punch Sami in the head as hard as he can, which did the trick on SmackDown last Tuesday. They’re also asked about how someone else can find true love. Maria goes on and says unfortunately that won’t happen for most people because there is just one Mike and one Maria. She says their love is one of a kind. Kayla wishes Mike good luck but he says he doesn’t need luck because he has love. We go back to the panel and Lawler cracks a joke about how expensive divorce is. The panel goes over tonight’s card again. Renee sends us to the ring for a match. Aiden English is in the ring under a spotlight as fans boo. English introduces himself and sings a song but the boos continue. English is interrupted as the music hits and out comes Tye Dillinger. Tom Phillips welcomes us. He’s joined by JBL and Byron Saxton. The bell rings and the “10” chants start up. They lock up and English applies a headlock. English drops Tye with a shoulder and poses for more boos. They trade holds and Tye sends English into the corner. Tye taunts English with a 10 and the chants start back up. English tries to come from behind but gets caught. English still takes control but Tye comes out of the corner and floors him. Tye stomps away in the corner as fans get behind him. English quickly turns it around with a shot to the jaw from the apron. English comes right in and nails a knee that sends Tye into the corner head first. English unloads as fans boo. English keeps control and drops Tye out of the corner again. English stands tall and poses as fans boo some more. We go to break. Back from the break and English is covering for a 2 count. English keeps control and grounds Tye in the middle of the ring. English sings a little song while keeping Dillinger grounded. Dillinger finally nails a dropkick as fans start to rally for him. Tye unloads but English avoids a Tye Breaker and retreats to the floor. Dillinger follows but English suckers him in. They end up back in the ring and Tye hits a big spinebuster for a close 2 count. They go to the top but English fights off a superplex. English headbutts Dillinger to the mat. English nails a crossbody but Tye rolls through for a close 2 count. English avoids another Tye Breaker and plants Tye face first for a close cover. English throws a fit in the middle of the ring now. They trade shots and pin attempts. More back and forth. English nails the Director’s Cut for the pin. – After the match, Aiden stands tall and celebrates as we go back to the panel. – We get more discussion on tonight’s matches. Renee shows us Facebook video from earlier today with WWE Champion Jinder Mahal and The Singh Brothers arriving. Announcers from WWE India approached him for comments and he spoke in Punjabi about defeating Randy Orton tonight. We get a video package for tonight’s Punjabi Prison match and Renee shows us tweets from Jinder and Orton. That’s it for the pre-show. – The 2017 WWE Battleground pay-per-view opens with a video package. – We’re live from the Wells Fargo Center in Philadelphia, Pennsylvania as Tom Phillips welcomes us. We see the Punjabi Prison structure above the ring. Tom is joined by JBL and Byron Saxton. We go right to the ring as The New Day comes out. Tom introduces some of the international announce teams at ringside. SmackDown Tag Team Champions The Usos are out next. Kofi nails a dropkick on Jey Uso to start the match and takes control. Xavier Woods tags in and they double team Uso with several moves as Big E looks on from ringside. Woods works over Uso but Jimmy Uso tags himself in and they turn it around with some double teaming. Uso beats Woods down. The referee is distracted by Kofi, allowing more cheap shots. The Usos keep control as fans try to rally for Woods. Woods catches a kick but Uso comes right back with a kick to the face for a 2 count. Jey drops Woods again and in comes Jimmy for more double teaming. Uso stomps away in the corner now. Jimmy charges and hits the Umaga splash for a 2 count. Jimmy chokes Woods with the rope and distracts the referee, allowing Jey to connect with a boot to the head. Jey tags back in comes off the top with a shot to the chest right after Jimmy nails a backbreaker. Jey takes Woods to the corner and rocks him after placing him on the top. He follows up with chops. Uso climbs up for a superplex but Woods fights him. Woods headbutts Jey to the mat. Woods nails a missile dropkick. Kofi tags in and unloads on both of the champions. Kofi drops Jimmy as he charges. Kofi with the Boom Drop on Jimmy. Fans rally for The New Day again. Jimmy avoids a Trouble In Paradise. Kofi goes to the apron. Both champs get dumped to the floor. Woods tags in but Kofi goes to the top and leaps back onto The Usos but they catch him and double powerbomb him onto the floor. Fans boo. Woods comes over but gets caught with an uppercut. Jimmy brings Woods back in after wasting a bit of time on the floor. Jimmy goes for the big splash but misses. Woods drops Jimmy with a new move for a close 2 count. Jimmy blocks the Honor Roll and leaves Woods laying. Jey comes in and Woods gets tossed into a Samoan Drop for a close 2 count. Big E can’t believe it. Kofi is still down on the floor. Woods counters Uso but they turn it right back around. Woods fights both champs off again from the apron and nails an enziguri to Jey. Woods goes to the top, walks the rope and leaps for an elbow drop but Jimmy kicks him in mid-air. Woods still finds a way to kick out and no one can believe it. Jimmy applies the crab now but Woods is close to the rope. Uso tightens it and brings Woods to the middle of the ring. Fans rally and Big E cheers Woods on. The hold is finally broken. Uso argues with the referee. Kofi finally comes back and tags in. They hit the Midnight Hour but Uso kicks out right before the 3 count. Kofi springboards in but lands on his feet and eats a superkick from Jimmy. Jey tags in and hits the big splash but Kofi still kicks out at 2. Fans chant “this is awesome” now. The Usos climb both turnbuckles but Woods takes Jey out. Jimmy leaps to Kofi but he moves out of the way. Kofi drops Uso with Trouble In Paradise. Woods nails the big elbow drop on Uso and covers for the pin. – After the match, the new champions celebrate as Greg Hamilton makes the announcement. We get replays and come back to The New Day celebrating with their titles. 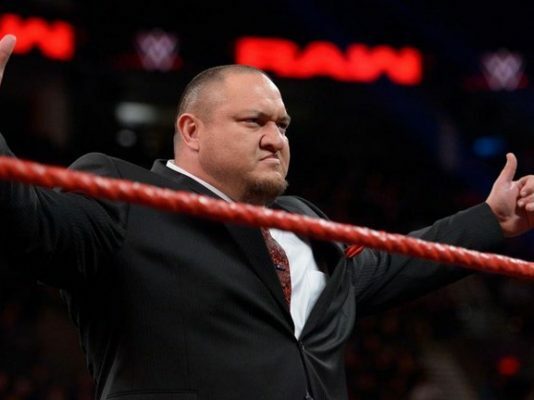 – Tom shows us happenings from the Shinsuke Nakamura vs. Baron Corbin feud. We go to the ring and out first comes Shinsuke Nakamura to a pop. Baron Corbin is out next with his Money In the Bank briefcase. They meet in the middle of the ring and Corbin talks trash as Nakamura mocks him. Nakamura strikes first and they go at it. Corbin takes Nakamura to a corner but Nakamura fights out. Corbin ends up on the floor. Nakamura stares him down, daring him to come back in. Corbin ends up in the ring as Nakamura goes out after him. Corbin stares Nakamura down waiting for him to come back in but Nakamura plays mind games back. Nakamura runs back in but Corbin nails a big right hand. Corbin drops Nakamura and stomps away. Corbin keeps control and applies a bear hug in the middle of the ring as fans start to rally for Nakamura. Nakamura fights out but Corbin keeps control. Nakamura catches Corbin’s arm and looks to try for a triangle but Corbin overpowers him and lifts him up. Nakamura breaks it but Corbin nails a big boot for a 2 count. They go to the floor and Corbin sends Nakamura into the barrier a few times. Corbin brings it back into the ring and talks some trash as fans boo. Corbin keeps working on the back and goes to another bear hug. Nakamura stuns Corbin but misses a kick and comes right back with a left. Corbin goes down to one knee. Nakamura unloads with kicks now. Corbin catches a kick but Nakamura nails him. Nakamura finally drops Corbin with a dropkick. Nakamura unloads and sends some good vibrations in the corner. Nakamura places Corbin on the top and follows up with the high knee to the gut. Nakamura with another running knee for a 2 count. Corbin ends up running back into the ring and flooring Nakamura with a huge clothesline for another 2 count. Corbin beats on Nakamura and stands tall to more boos. Nakamura blocks a suplex with a knee to the head. Nakamura with big knees to the shoulder now. Nakamura slams Corbin on his face and waits for him to get up. Corbin avoids a Kinshasa and hits Deep Six for a 2 count. Both are down now. They finally get up and Corbin strikes first. Nakamura fights back in the middle of the ring. Nakamura blocks a chokeslam and drops Corbin into a Backstabber of sorts. Nakamura with more offense and a shot to the back of the neck before rallying the crowd. Nakamura waits in the corner but Corbin isn’t moving. Nakamura grabs Corbin for an exploder suplex but Corbin back kicks him for a low blow. The referee calls the match as fans boo. – After the bell, Nakamura is still down as his music starts playing. We go to replays. Corbin is also slow to get up after the match but he is smiling at what happened. Corbin gets his MITB briefcase and raises it while walking to the back. Corbin stops and turns to come back to the ring. He nails Nakamura in the gut with the briefcase and leaves him laying with End of Days. Corbin stands tall over Nakamura as fans boo. Corbin grabs the case and leaves. We get a replay of the post-match attack as Corbin stands tall at the entrance and Nakamura recovers on the mat. – Kevin Owens is shown backstage getting ready for his match. – Tom leads us to a promo for the next match. We go to the ring and SmackDown Women’s Champion Naomi comes out first to join the announcers for commentary. Becky Lynch is out first, followed by Tamina Snuka. The winner of this match will go on to face Naomi at SummerSlam next month. Natalya is out next, followed by Lana. Charlotte Flair is out last as the others look on. The bell rings and they all go at it. Flair takes Lana to the corner with chops. Lana goes to the floor as Natalya rolls Charlotte up for 2. Natalya goes for a Sharpshooter but Flair kicks her off. Becky and Tamina go at it. Tamina drops Flair with a headbutt and sends her to the floor. Tamina with a 2 count on Becky. Becky runs the ropes but Lana trips her and pulls her out. Lana sends Becky face first into the announce table. Natalya goes for a Sharpshooter on Tamina but Lana yells at her and distracts her. Lana pulls Natalya to the floor and talks trash before leaving her laying. Lana comes back into the ring as Tamina does. Flair enters and tells them both to bring it. Flair tries to fight them both off but they beat her down for the double team. Tamina slams Flair and Lana drops an elbow onto her. The double team continues as Lana kicks Flair while Tamina holds her. Lana with more trash talking. Flair counters Tamina and drops her. Flair kicks Tamina and stares Lana down. Lana tells her to bring it. Tamina grabs Flair’s leg and Lana kicks her to the mat. Lana covers Flair for a 2 count. Lana and Tamina continue the beat down for a few minutes. Becky finally makes the save. Flair and Becky hit double exploders. Lana and Tamina are sent tot he floor. Flair and Becky size each other up now. Charlotte with a 2 count after a sweep. More back and forth between Charlotte and Becky. Natalya comes in and tries to steal pins on Flair and Becky but they kick out. Becky with an elbow as she and Natalya go at it. Becky with a suplex to Natalya. Lana runs in but she also takes a Bexploder. Tamina runs i next but Becky catches her for a suplex. Tamina fights Becky off and nails a suplex. Tamina with a Samoan Drop on Natalya to send her down. Charlotte runs Tamina over. Charlotte goes for the Figure Four on Natalya but it’s countered for a 2 count. Natalya drops Flair with a big discus clothesline. Natalya with the Sharpshooter in the middle of the ring to Charlotte now. Lana runs in and nails Natalya, trying to steal the pin on Charlotte. Charlotte kicks out and Lana is frustrated. Becky runs in and puts the Disarm Her on Lana but Tamina breaks it with a kick. Tamina with a Samoan Drop to Becky. Tamina spears Charlotte from the apron to the floor. Lana with a close 2 count on Becky. Becky applies the Disarm Her again but Tamina makes the save once again. Tamina scoops Becky but she fights out. Becky with the Disarm Her on Tamina now. Tamina taps and gets eliminated. Becky immediately goes with the Disarm Her on Lana again. Lana taps and is eliminated. Natalya comes over and pins Becky. Becky has been eliminated. Charlotte runs in with a close pin attempt on Natalya. Charlotte pulls her over for the Figure Four but Natalya turns it into a cross armbreaker but Flair resists. Charlotte ends up powering up and powerbombing Natalya for another close 2 count. Charlotte goes up top for the moonsault but Natalya gets her knees up and Charlotte lands hard. Natalya slams the back of Flair’s neck into the turnbuckles and drags her into the middle of the ring. Natalya covers for the pin and the title shot at SummerSlam. – After the bell, Natalya has her arm raised as her music hits. Naomi enters the ring while Natalya is staring down at Flair. Naomi offers her hand but Natalya just stares at her and leaves the ring. Natalya’s music starts back up as we go to replays. – We get a video package with highlights from the recent WWE United States Title change at Madison Square Garden. Back to the ring and out first comes Kevin Owens. WWE United States Champion AJ Styles is out next as we get formal ring introductions from Hamilton and some trash talking from the two. The bell rings and Owens unloads on AJ. Owens keeps control and talk some more trash but AJ runs the ropes and comes back, sending Owens to the floor to regroup. Owens comes back in and they go to lock up but AJ goes behind. AJ with more offense that sends Owens to the floor for another breather. More back and forth in the ring now. AJ nails a dropkick that sends Owens to the floor once again. They fight on the floor now. AJ sends Owens over the barrier. AJ charges for an attack but it backfires and Owens turns it around on the floor. Owens sends AJ into the ring post and brings it back into the ring for a senton. Owens covers for a 2 count. Owens keeps control and keeps AJ grounded on the mat with a headlock while talking trash. AJ finally fights up and out of the hold but Owens drops him for more boos. Owens goes for another senton but AJ gets his knees up. AJ with forearms to the jaw now. Owens decks him and nails a DDT in the middle of the ring for a close 2 count. Owens argues with the referee and goes back to the headlock. AJ fights up and out again. They trade shots but AJ gets the upperhand and unloads. AJ drops Owens with a clothesline. AJ with the flying forearm. Owens rolls to the corner. AJ with a splash in the corner. AJ scoops Owens on his shoulders but can’t get him all the way up. More back and forth. AJ counters and slams Owens on his face for a 2 count. Owens ends up going for a superkick but it’s blocked. Owens also blocks a Styles Clash. Owens drops AJ for a close 2 count. AJ nails the fireman’s carry neckbreaker for a close 2 count. Fans chant for AJ now. AJ springboards in with a 450 but Owens gets his knees up and AJ lands hard. Owens covers for a 2 count. Owens with the corner cannonball for another 2 count. Owens shows frustration now. Owens takes Styles to the top and rocks him. Owens climbs up but AJ resists. Styles headbutts Owens and goes for the sunset flip powerbomb but Owens hangs on. Styles turns it into the Torture Rack and drops Owens to the mat for another pin attempt. AJ goes to the top but Owens pushes the top rope, crotching him. Owens climbs up for a superplex but AJ fights back. Owens with a big shot to the face. AJ slides down and drops Owens face first into the turnbuckle. AJ keeps control and springboards up from the apron but Owens rolls to the floor. AJ puts on the brakes but Owens takes out his legs on the apron. Owens sends AJ into the ring post and drops him with an armbreaker. AJ drops Owens with a pele kick. Styles for the Styles Clash but his shoulder is bothering him. Owens tosses AJ into the referee and he goes down. AJ is also down, as is Owens. AJ gets up first but Owens superkicks him to the mat. Owens grabs AJ and yells at him. AJ avoids a pop-up powerbomb and drops Owens into the Calf Crusher in the middle of the ring. The referee starts to get up as Owens inches to the bottom rope. Owens turns the submission around on AJ. AJ fights out and applies a Crossface of his own. Owens turns that over into a pin attempt and keeps AJ’s shoulders down as the referee slowly recovers and counts the pin. – After the match, Owens takes the title and celebrates as we go to replays. Owens leaves with the title as his music plays. – The Singh Brothers are backstage with Jinder Mahal. They inform him that they can’t be there with him in the Punjabi Prison tonight ubt they will be backstage watching and celebrating the win. Jinder has no worries because he alone will take out The Viper and make sure Punjabi Prison is the final resting place of Randy Orton’s legacy, plus he has the 1.3 billion people of India with him. – We get a promo for tonight’s Flag Match. We go to the ring and out first comes Rusev with the Bulgarian flag as Hamilton goes over the rules for the match. Tom introduces the other international announce teams in the arena tonight. The referee takes the flag and a crew member places it onto the pole in the corner. We wait as fans start with the dueling chants for John Cena. The music hits and out comes Cena with the American Flag to a loud reaction. The bell rings and Rusev makes an early grab for the flag. Back and forth to start. Rusev drops Cena and goes for his flag but Cena nails a bulldog from the corner. Cena goes for his flag but Rusev comes from behind and hits an Electric Chair drop. Rusev beats Cena around for a few more minutes and talks trash. Rusev tosses Cena to the mat and goes for the Bulgarian flag but Cena comes from behind. Rusev sends him down. Cena fights back at Rusev. Rusev fights back and drops Cena with a big DDT. There are two steel steps on the stage, each painted the colors of the respective flags. This is the finish line that the flags have to be brought to. Cena finally makes a comeback and hits the shoulder. Cena nails a Five Knuckle Shuffle and readies for the Attitude Adjustment. Rusev counters and plants Cena with a spinebuster. Rusev tosses Cena out of the ring. Rusev climbs for his flag but Cena meets him on the pole. They fight but Cena sends Rusev to the mat. Cena goes for the top rope leg drop but Rusev catches him and almost hits a whole powerbomb. Rusev climbs back for his flag and takes it off the post. He must take it to the finish line near the stage now. Rusev comes down from the top and Cena dropkicks him. Rusev drops the flag. Cena ends up catching Rusev with the AA. Cena goes for his flag but Rusev comes from behind with a powerbomb attempt but Cena turns it around. Cena gets Rusev in the STF now. Rusev taps but there are no submissions in this match. Rusev appears to be out as Cena breaks the hold. Cena climbs up for the American flag now. Cena unhooks the flag and brings it down. Cena turns around to a dropkick from Rusev and they both go down again. Rusev has the Bulgarian flag now. Rusev starts going for the finish line but Cena leaps off the apron with an axe handle and takes him down on the floor. Cena whips Rusev into the steel steps. Cena rolls back into the ring and grabs the American flag. Cena leaves the ring for the finish line now. Rusev comes from behind and clubs Cena. Cena drops the flag on the ramp and Rusev beats him back down at ringside. Cena crawls up the ramp for the flag but Rusev puts him back down. Rusev raises the Bulgarian flag to boos. Rusev walks for the finish line but Cena grabs his leg. Rusev puts the flag down and goes to work on Cena but Cena fights back. They’re up by the finish line now. Cena sends Rusev into an LED board face first. Cena runs and jumps off his part of the finish line but Rusev catches him. Rusev with a big fall-away slam on the steel. Fans do dueling chants as Rusev gets up. Rusev brings a table over to the two finish line podiums. Fans chant ECW now. Rusev brings another table over to the finish line now. Cena has crawled over to the same area. Rusev stacks one table on top of the other in front of the American podium. Rusev climbs onto the podium and brings Cena up, talking trash to his face. Rusev scoops Cena for an AA but Cena pushes Rusev off the podium. Cena walks down the ramp and grabs the American flag but Rusev meets him and they fight. They both drop each other and go down at the same time. Cena grabs the American flag and is the closest to winning. Cena crawls with the flag. Rusev is slow to get moving. Rusev grabs the flag stand and decks Cena with it. Rusev stomps on Cena’s back and applies The Accolade between the two podiums. Rusev breaks the hold and walks towards the Bulgarian flag as fans boo. Rusev grabs his flag and raises it as the boos continue. Rusev heads for the podium and stands on top but Cena blocks him from putting it in the stand. They struggle on top of the podium. Cena scoops Rusev for an AA but Rusev fights out. They go back down to the floor and Rusev drops Cena with a superkick. Rusev stomps on Cena’s back and applies The Accolade again but Cena immediately powers up with Rusev on his back. Cena walks up the American podium and puts Rusev through the two stacked table with an AA. Cena walks back down and grabs the American flag, returning to his podium with the flag in the air. Cena places the flag in the stand and the referee calls for the bell. – After the match, Cena stands tall next to the American flag as his music hits. We go to replays with Rusev down on what’s left of the two tables. Cena salutes the flag and heads to the back. We see Rusev still down as the camera focuses on the American flag one more time. – We get another “Fashion Files” segment with Tyler Breeze and Fandango. The Ascension comes in and tries to take credit for the recent attacks and the office getting destroyed but it doesn’t work. Breezango is trying to figure out who could have been behind the attacks when the lights go out and it sounds like someone’s being attacked. Fandango turns a light on and Breeze is laid out. Fandango also gets dropped and dragged away by someone we can’t see. – We see video from Mike Kanellis making his WWE debut with a win over Sami Zayn on SmackDown last Tuesday. We go to the ring and out comes Mike & Maria Kanellis. Sami Zayn is out next. Back and forth to start. Sami with some aggressive action. Sami goes on and clotheslines Mike over the top to the floor. Sami runs the ropes but Maria gets in the way. Sami goes to the floor and Maria distracts him, allowing Mike to nail a big right hand. Mike stops to rub noses with Maria at ringside. Mike brings it back into the ring and hits a big clothesline for a pin attempt. Mike stomps away now. Mike keeps control but stops to blow a kiss at Maria. Mike drops Sami again and covers for a 2 count. Mike with more offense and a corner clothesline, followed by another. Mike runs the ropes and drops Sami with another strike for a 2 count as Maria cheers him on. Mike mounts Sami and works him over. Mike crawls over and kisses Maria through the ropes. Mike goes right back to work on Sami with a knee to the back. Sami finally hits a clothesline and looks to make a comeback. Sami with a big backdrop. Sami tosses Mike over the top to the floor. Sami runs the ropes for a dive and nails it as Maria looks on. Sami rolls Mike back in and goes to the top. Sami with a crossbody for a 2 count. Sami gets up first and goes for a Blue Thunderbomb but Mike fights him off. Sami keeps control and drops Mike with a big DDT. Sami goes for the exploder suplex but Maria runs into the ring and gets in the way. She yells at Sami and the referee. The referee orders her out of the ring. Sami turns around to Mike grabbing him but Sami slides out. Sami sends Mike into the corner with the exploder. Sami nails the Helluva Kick for the win. – After the match, Sami has his arm raised as the music plays. Maria checks on Mike but he’s slow to roll out of the ring. Sami celebrates as we go to a break. – The announcers lead us to a video for tonight’s main event as the Punjabi Prison structure is brought down around the ring. Back to the ring and out first comes WWE Champion Jinder Mahal to the Punjabi Prison. The Singh Brothers are backstage. Randy Orton is out next to the structure. Orton tests out the bamboo as we get ready to start. The referee calls for the outer structure to be dropped down now. You must escape both structures to win the match. The bell rings and we get formal ring introductions from Hamilton. There are no pinfalls, no submissions, no count outs and no disqualifications. Each of the 4 doors will be raised when called for by a competitor. After 60 seconds, the door will shut and remain shut. The outer structure has no doors and the only way to win is by escaping both structures. The match starts and Orton goes right to work on Jinder, taking it to the corner. Jinder turns it around and calls for the first door to be opened. The door is raised but Orton comes over and beats Jinder around. Orton goes to leave the door but Jinder stops him and they tangle on the apron. Jinder goes for the door but Orton stops him. There’s a timer counting down for when the door must be shut. Orton sends Jinder into the bamboo and goes for the door again. Jinder grabs his leg and pulls him back. Jinder goes for the door but can’t make it. The first door is closed and locked for good. Orton goes right back to work on Jinder but Jinder turns it around and drops him with an armbar. Jinder keeps control and drops several knees on the mat. Jinder bends Orton’s arm around the steel-reinforced bamboo and continues focusing on the shoulder. Jinder takes Orton down in the middle of the ring now. More back and forth now. The second door is raised open. Orton tries to kick Jinder away so he can escape. Jinder drops Orton and goes for the door but is unable to make it. The second door is shut for good and padlocked. Orton turns it around and works Jinder over. Jinder jumps out of nowhere and starts climbing the structure. Orton climbs up but gets knocked down to the mat. Jinder gets caught up on the top rope and lands hard as well. Orton slams Jinder back into the structure a few times. Jinder blocks the draping DDT and sends Orton flying into the structure. Jinder leaps at Orton and decks him. Jinder pins Orton between the ropes and the bamboo again. Jinder comes back but Orton catches him this time. Orton suplexes Jinder into the structure and does it again. Orton with another shot from the apron. Orton goes over and has the third door raised now, his first. Jinder stops Orton from leaving through the door. Orton fights back but Jinder yanks the arm down. Jinder tries for the door now but Orton stops him. Orton drops Jinder with a big uppercut. Orton goes for the door but Jinder stops him, yanking him down by the arm again. The third door has been closed for good. Both Superstars sit up on their knees now. They stare each other down as they get to their feet. Orton side-steps and nails a powerslam. Orton is favoring the shoulder now. Orton with the second rope draping DDT. Orton calls for the final door to be raised but he’s taking his time to leave. Orton drops down, hits the mat and waits for Jinder. Jinder blocks the RKO and nails a knee to the face. They both go down. Jinder goes for the Khallas but Orton nails the RKO. The Singh Brothers run down and pull Jinder out of the door. The final door is closed for good. Orton is still inside the main structure. The Singh Brothers have Jinder on the outside, looking for a way to get him up and over. Jinder climbs the outer while Orton climbs the inner structure. Orton makes it over, bad arm and all. Orton fights Jinder while the two are on the inner wall of the outer structure now. Orton sends Jinder down to the floor. The Singh Brothers grab Orton’s legs and pull him down from the structure. They stomp away on Orton while he’s down. Fans boo. Jinder gets to his feet now. The Singh Brothers hold Orton and shove him into a big shot from Jinder. Orton goes back down. Jinder climbs the wall again. The Singh Brothers pick Orton up and make him watch Jinder escape. Orton fights them off and drops them on the floor. Orton looks up and climbs after Jinder now. Orton grabs Jinder’s legs to bring him back down. Jinder hits the floor. Orton tosses Jinder into the bamboo. Orton with another floor suplex to Sunil Singh. Samir Singh goes down again. Jinder ends up grabbing a kendo stick from under the ring and beating Orton around with it. Jinder looks to be going for The Khallas again but Orton fights him off. Orton grabs a kendo stick but Jinder begs him to show mercy. Orton unloads with the kendo stick. One of the Singh Brothers takes kendo stick shots as well. Orton favors the arm again as he starts climbing the structure. Samir is small enough to get out of the structure. He climbs up the outside and meets Orton on the other side. Orton is almost at the top but Sami stops him from the other side. Orton rocks Sami and knocks him off the top of the structure, down through an announce table. Orton gets a big pop for the table bump. Jinder climbs up and grabs Orton’s leg now. Orton and Jinder fight up on the structure wall now. They go back down to the floor and Orton hits the floor. Jinder slams Orton back into the bamboo. Sunil is also down on the floor. Jinder goes for a boot but Orton moves. Jinder’s leg gets stuck in the structure. Orton takes advantage and hits a DDT on the floor. Orton looks for another weapon and grabs a steel chair. Sunil goes down with a chair shot. Orton with chair shots to the gut and back of Jinder. Jinder takes another chair shot to the back. Orton keeps on and drops the chair. Orton looks to the top of the structure and starts climbing while Jinder and Sunil are down. Sunil jumps up and tries to pull Orton down. Orton kicks him in the face, knocking him down to the floor. Orton is slow to climb up. Music hits and out comes The Great Khali to a pop. Orton starts climbing more. Khali shakes the structure until Orton falls and is dangling by one arm. Khali climbs up the outside of the structure and grabs Orton by the throat. Khali chokes Orton as Jinder starts climbing up. Jinder greets Khali and stares as Khali chokes Orton from the other side of the structure. Jinder climbs over the top of the Punjabi Prison structure and stops again to laugh at Orton. Jinder climbs down and touches the floor to win. – After the match, Jinder and Khali embrace as the music hits. Khali raises Jinder’s arm and takes the WWE Title from the referee to hand it to him. Orton is down on the floor selling the choke and the arm injury. Khali and Jinder continue their celebration as we go to replays. We come back to Jinder and Khali with their arms raised on the ramp. Orton is still down on the floor. Battleground goes off the air with Khali and Jinder staring back at Orton.